In press coverage of our struggle, you’ll often see that predatory landlords, poor living conditions and hardship are the focus. Reporters interview talking heads from government-funded organizations that have nothing to do with our organizing. In this and other videos from Sub.Media you will see what the story of Parkdale is really about. This is a story about what is possible when working class people come together to take control over our lives. We will not sit back and watch our neighbourhood be destroyed eviction after eviction, rent hike after rent hike and so, we organize. And together we have power. 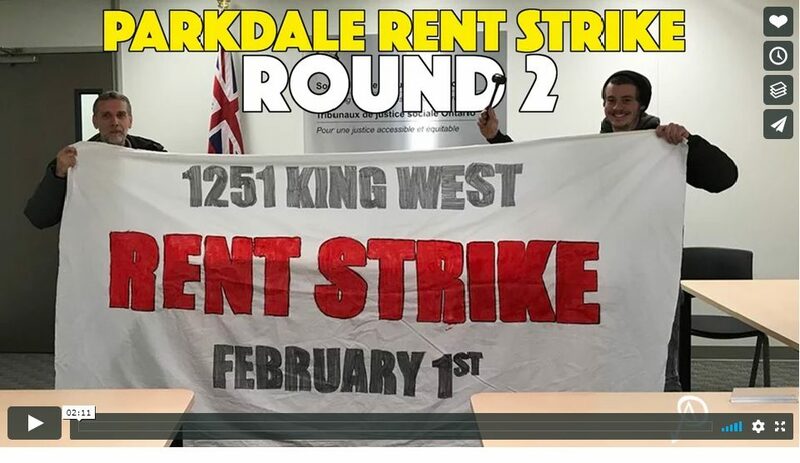 On Friday February 2nd, tenants from 1251 King St West, in Parkdale, Toronto, arrived at the Landlord & Tenant Board to formally reject their landlord’s application for an above guideline rent increase. The day before, over 50 units in the building went on rent strike to demand that the owner of their building, Nuspor Investments, drop the planned rent hike and carry out repairs to their units.